What would be the first confirmed chemical weapons attack of the Syrian conflict (if confirmed, and it's not the first allegation) was reported on April 9, 2013. As with one of the March 19 alleged attacks, rebels say it happened in or near Al-Otaybah (Ateibeh), east of Damascus. 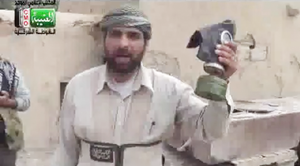 There were apparently no human casualties, rebels say, as they had on protective gear before the firing (see inset). But farm animals apparently died. This page was last edited on 11 April 2013, at 11:27.